Today’s super-delicious recipe is brought to you by dear old Dad. I’m finally sharing his go-to curry recipe and I couldn’t be more excited. It’s not the typical Thai-style curry you order for takeout, instead it’s an Indian-Style Yellow Curry with an assortment of what we call in our household “da boys”…aka a bunch of tasty toppings that take a fairly simple, straightforward recipe completely over the top. This Easy Indian-Style Yellow Curry is so easy, it’s almost comical how much flavor it has for so few ingredients involved. It’s totally achievable on any night of the week, and you can also easily control the spice so that even the pickiest of eaters in your household get excited about it. Although this recipe has very few ingredients, the one that I highly recommend you pay close attention to is the type of curry powder you use. Our family favorite has always been this Sun Brand Madras Curry Powder, and I highly recommend that you invest in some yourself ASAP. Sure, you could use some other brand of curry powder, but I guarantee that this one does the trick and, trust me, my family doesn’t mess around when it comes to our go-to cooking ingredients. 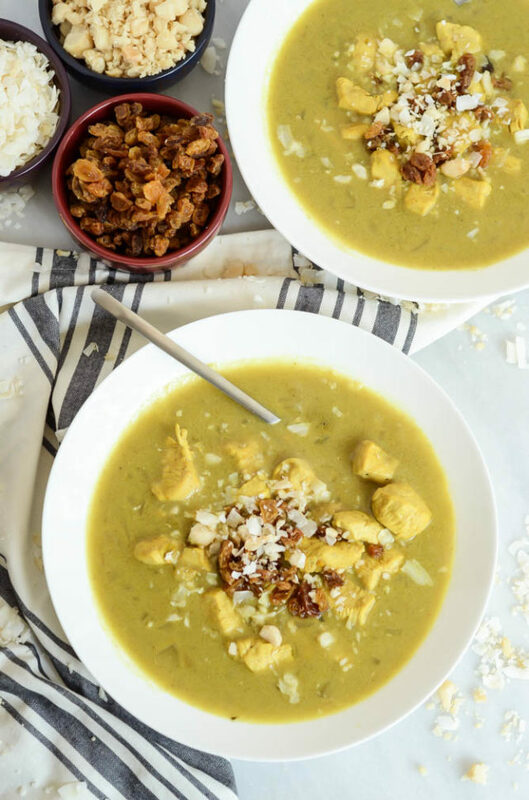 Aside from the curry powder, the only ingredients you’ll need for the soup itself are coconut milk, a can of green chilies, onion, chicken and chicken broth. And, depending on how thick your coconut milk is, you may also need a “cheater’s roux” made simply of melted butter and flour. Of course, there are also variations you can make depending on special dietary preferences. 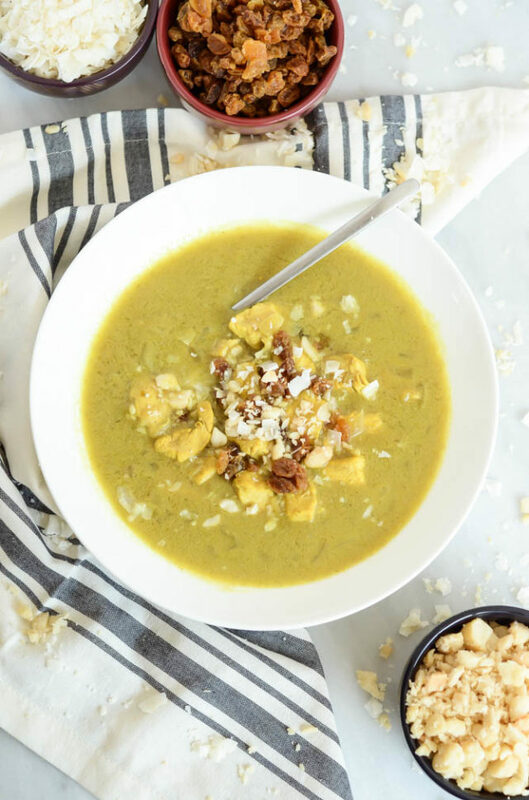 For example, use tofu and vegetable broth to make this dish vegetarian, or you can also omit the green chilies if you have some in your group who are averse to a lot of spice. I can guarantee you will not go wrong with any of these, and you may even never resort to just “plain old” curry ever again. We’re slowly getting into cooler weather here in Santa Barbara, so I’m looking forward to hunkering down with our new little one and enjoying all the comfort food dishes it’s been too hot to even think about for the past few months. 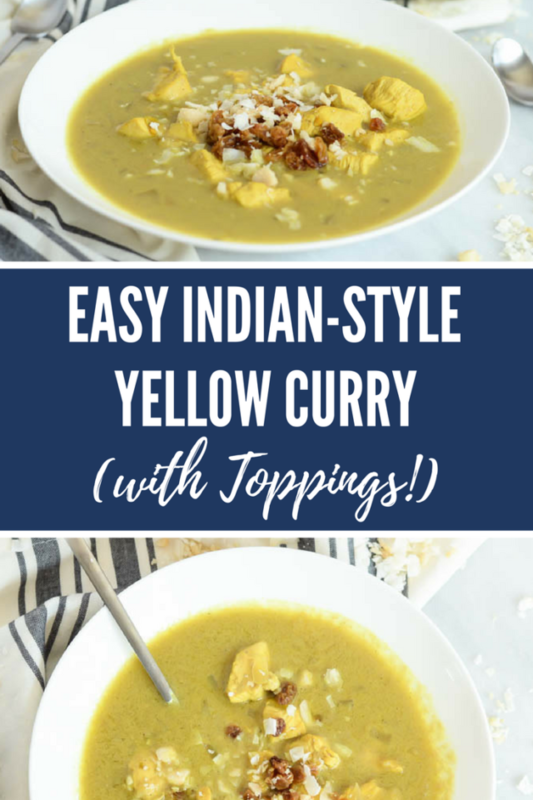 This Easy Indian-Style Yellow Curry is definitely on my list of things to whip up as often as we can! 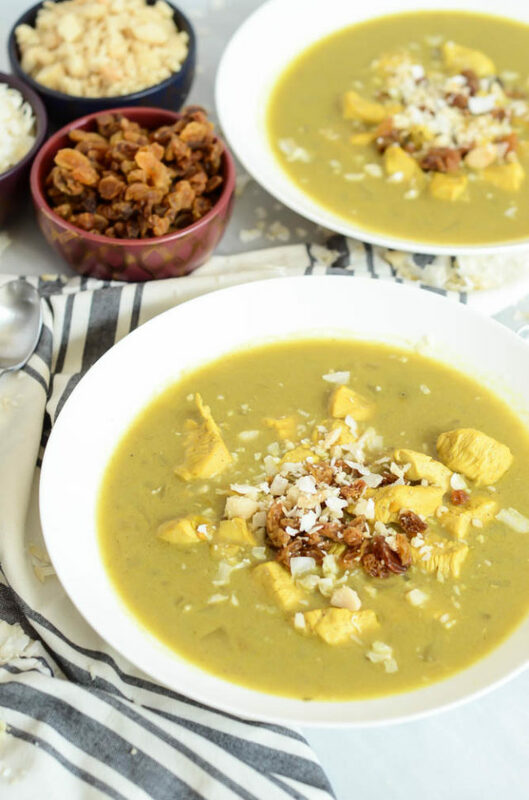 This Indian-style yellow curry is incredibly tasty and easy to whip up on any night of the week, plus it's served with toppings galore! In a large saucepan or Dutch oven, heat the olive oil over medium heat. Add the onion and chilies and saute until fragrant, about 5 minutes. Add the chicken and begin to brown it. Sprinkle on the curry powder and continue stirring until all sides of chicken are browned and curry powder is incorporated. Pour in chicken broth and bring mixture to a boil, stirring occasionally. Once mixture has come to a boil, bring down to a simmer and add in the coconut milk. At this point, you’ll have to make the call of whether you want to thicken up your curry or not. If you like it a bit creamier, whisk together the melted butter and flour in a small bowl and then stir it into the soup. If you’re happy with a thinner curry, leave it as is. Place toppings in small bowls and set them out on the table for people to help themselves. Serve curry over cooked brown rice. 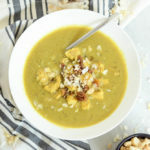 A vegan, Indian-inspired curried spinach dish is accompanied by homemade naan studded with crunchy, salty bits of bacon. Sometimes I just don’t know how I come up with certain things. 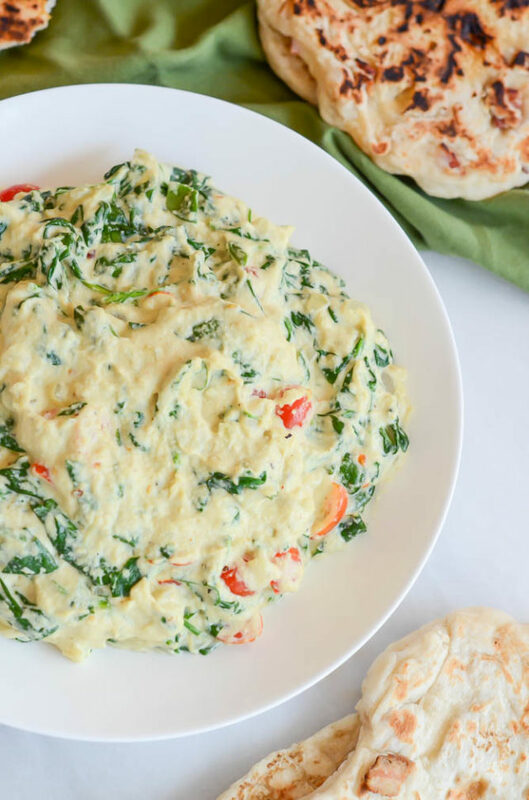 Take this Creamed Curried Spinach with Bacon Naan, for example. I suppose it’s not too surprising that I paired a creamy, vegetable-laden, curry-laced dip with everyone’s favorite Indian carb, but I’m not too sure adding chunks of bacon to the bread is really staying in line with the traditional flavors of that culture. Oh well, that’s what cooking is all about, right? Taking already established, delicious dishes and turning them into your own? And let me tell you a little story about bacon, and why I feel compelled to add it to just about everything I cook these days (in small amounts, that is.) You see, one of my hubby’s best friends has a family hook up with a local butcher in the Bay Area, and for my hubby’s bachelor party he literally brought all. the. meat. We’re talking tomahawk steaks, ham steaks, sausages and, of course, bacon. It was LITERALLY a sausage fest. My hubs came back raving about this bacon, and the next time we were up visiting his friend we snagged a small pack to bring home with us. Fast forward a few months, to Christmastime, and we had mentioned to his friend that we were due for a replenishment of our bacon stock. We show up to his parents’ house on Christmas Day, and he literally goes into the garage and comes back with a 15-POUND box of this bacon for us. So we’re basically set with bacon for life, or at least for the foreseeable future. Thank goodness for plenty of freezer space! 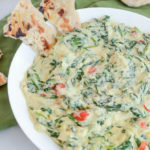 Needless to say, we always have some on hand so I couldn’t help but add a little bit to the naan I was making for this Creamed Curried Spinach. (I must also mention that I was partially inspired by our favorite little spot in Napa, Model Bakery, and the bacon bread that’s regularly part of their daily homemade bread selection.) Let me tell you, the end result is nothing short of spectacular. I adapted the naan recipe from this one I found on Girl Versus Dough, basically just adding in the bacon and using my stovetop griddle instead of the gas grill outside. 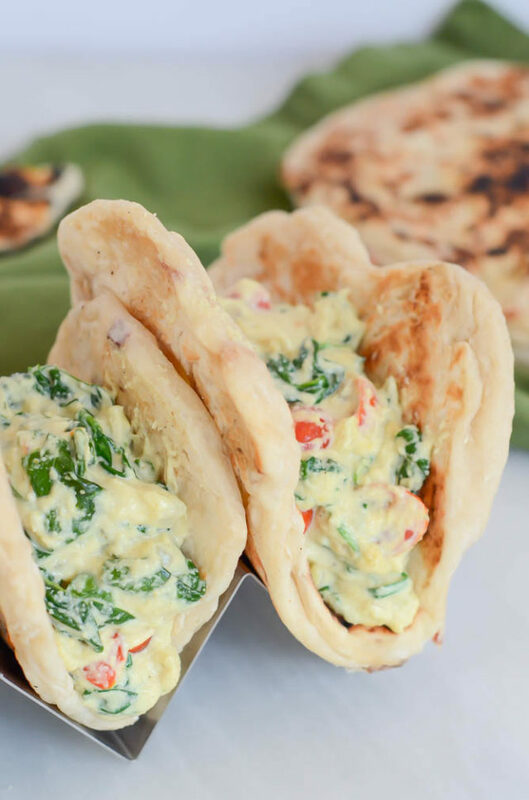 The end result is a chewy and moist naan that holds up extremely well to the whole dipping and scooping up the creamed spinach process, yet melts in your mouth save for the slight salty crunch of the bacon. Delish. 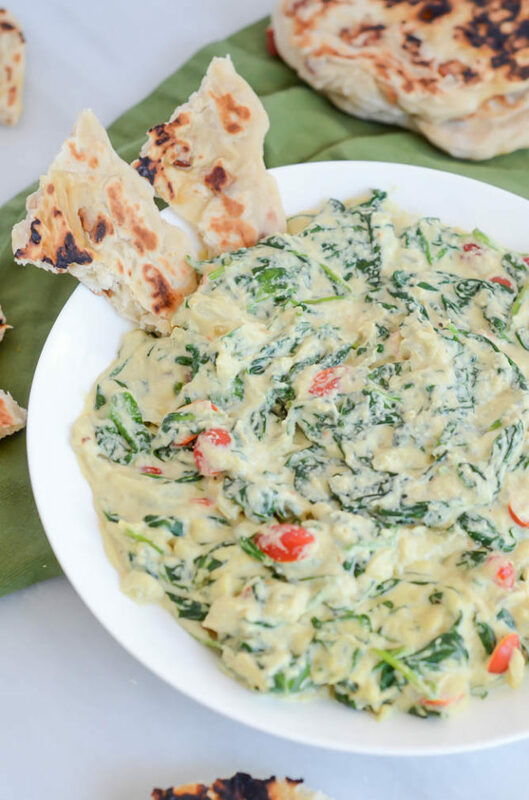 So now that we’ve talked about the bacon naan, I’ve also GOT to tell you about this Creamed Curried Spinach because it is out of this world. First of all, this part of the dish is completely vegan. Do you believe it? Well, if I told you I used my trusty cashew cream as a base I bet you would. Seriously, I don’t think there’s any sort of cream sauce that vegan sub can’t stand up to. So, if you’re vegan, I strongly urge you to give this a shot, and simply find (or make) some sort of substitute for the bacon naan. Okay, back to our Creamed Curried Spinach with Bacon Naan. When making the cashew cream this time around, I simply added a hefty dose of curry powder instead of nutritional yeast. I then stirred it into some wilted onions, garlic, and spinach, and fancied it up with some fresh cherry tomatoes and a dash of red pepper flakes. The result was so creamy and bursting with flavor, I really am giddy with excitement for you to try this. All glowing reviews aside, I do realize that Creamed Curried Spinach with Bacon Naan is not the most photogenic, but PLEASE do not let that stop you. You will be incredibly sorry if you do. Most Indian food involves dipping into a blurry blend of exotic herbs, spices and sauces without silverware, and this is no exception. Use your bacon naan as your spoon and really get in there and shovel some hefty scoops straight into your mouth. I’m pretty sure once you start eating this you’re not going to be able to stop, so get after it! First, make the naan. In a medium mixing bowl, combine the water, milk, yeast and salt. Next, add the Greek yogurt and honey, then slowly stir in the flour. Before the mixture gets too thick, stir in the chopped bacon and continue stirring until all ingredients are combined and a sticky dough forms. Cover the bowl with plastic wrap and let sit in a warm place, away from drafts, for about two hours or until doubled in size. Heat a griddle over medium heat on the stove. Spray with nonstick spray (I used coconut oil spray from Trader Joe’s.) Using your hands, form each piece of dough into a flat, oval shape that’s about 1/4-inch thick. Place the dough (working in batches) on the griddle and cook for about 3 minutes each side, until it becomes slightly charred and feels like it’s been cooked through. If your naan seems to puff up a lot when it’s cooking on its first side, simply flip it once that side’s done and then press down with the back of a spatula while it’s cooking on its second side. This will help it spread out more and cook more evenly. Remove cooked naan from griddle and keep in a warm oven until ready to serve. Next, make the curried cashew cream. Drain the cashews from their soaking water and add to a high-powered blender with the curry powder, ½ teaspoon salt and filtered water. Puree until a creamy sauce forms, adding a tad more water if needed. Measure out two cups of the cashew cream and reserve the rest for another use. In a large saute pan, melt the coconut oil. Add the garlic and onion and saute until fragrant and translucent, about 3-5 minutes on medium-high heat. Turn the heat down to medium-low and add about 1/3 of the fresh spinach to the pan, stirring until the spinach begins to wilt. Add the tomatoes. Next, add about 1/3 of the curried cashew cream. 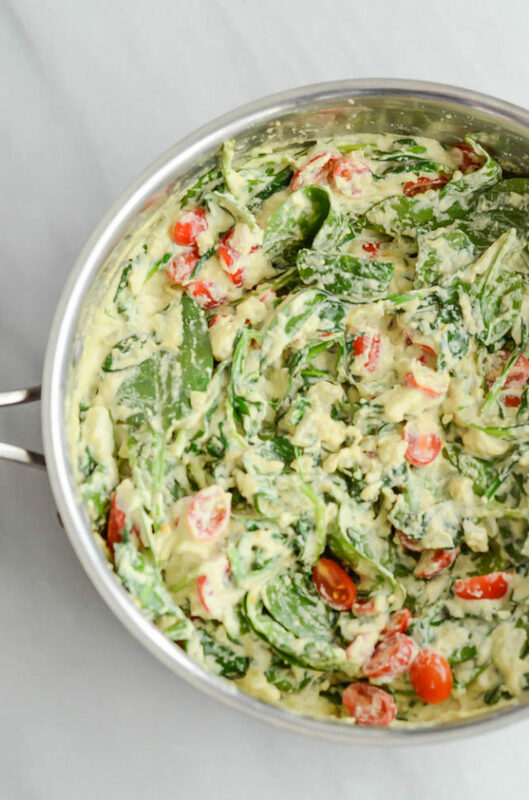 Continue this process two more times, until you’ve used up all of the spinach and the whole two cups of the curried cashew cream. Stir in the lemon juice, salt, pepper and red pepper flakes. Simmer on low until ready to serve. Serve with bacon naan. No utensils required! 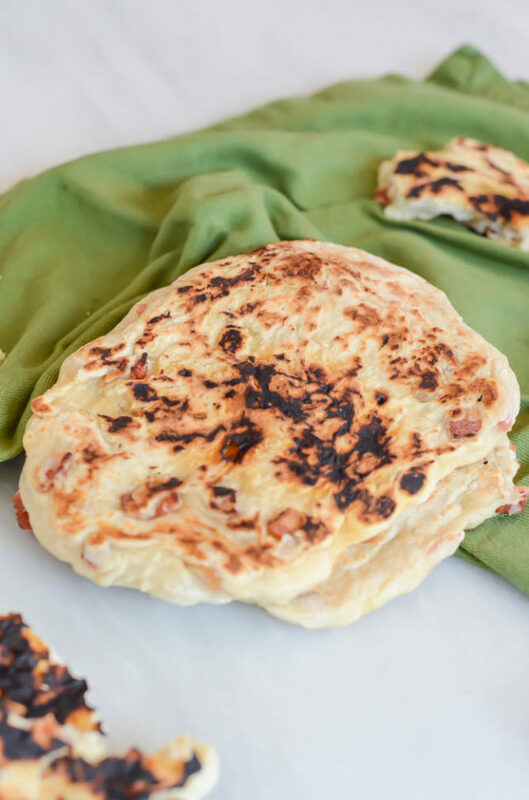 The Bacon Naan recipe was adapted from the No-Knead Grilled Naan recipe on Girls Versus Dough. Fall has officially arrived in the CaliGirl Cooking household! Seeing as Santa Barbara doesn’t see “fall-ish” weather until well into the month of October, it sometimes takes us a bit to get into cooking all of the fall things. One doesn’t necessarily want to be roasting squash or drinking warm pumpkin spice lattes when it’s over 80 degrees out! But I’m happy to report that on Sunday night we got our first rain of the season, and now I’m officially ready to start gobbling up enough orange-hued foods to turn my skin a funny color in the next two to three months, like this Pumpkin Curry Hummus and these Butternut Squash Crostini with Crispy Prosciutto and Sage. 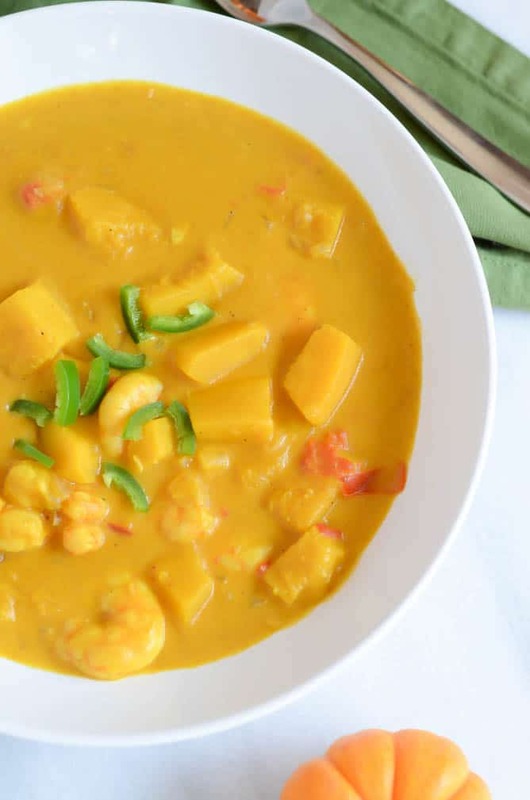 But what do you say we kick off the binge with this Double Pumpkin Curry with Shrimp? I can’t think of any other way I’d rather get my daily intake of beta-carotene and Vitamin A than in the form of this incredibly tasty one-pot meal. And really, I’m just the hugest fan of curry and can’t seem to get enough. It’s so healthy, yet so warm and comforting, the perfect cool weather dish. It’s also pretty darn quick and easy, so you really have no excuse not to make it for dinner tonight. I made this last Friday and we proceeded to eat it alllll weekend. Which brings me to another bonus of this Double Pumpkin Curry with Shrimp: it reheats so well! Make a batch tonight and enjoy it for the next couple of days. If my experience is any indication, you won’t be able to get enough. The hubs and I are going to be living on easy weeknight meals such as this for the next couple of weeks. It seems that the madness of the holidays has already started for us, and we’re traveling or otherwise busy just about every weekend from here until after the New Year. This weekend, we’re headed to Napa for one of our multiple-times-a-year trips. We try to get up there every few months, and are so lucky that we have plenty of friends up there to visit and stay with. This year we wanted to make sure we got up there during harvest, so we squeezed it in to our already incredibly busy schedule. We’ve already gotten some great recommendations from our friends up in the area, but feel free to comment below with any places you think are can’t-miss! After Napa this weekend, I’ll be back home for just a few days before turning around and heading back to the Bay Area to fly out to Oahu with my dad. We’re taking a little father-daughter food research trip and I couldn’t be more excited! I’ll be planning out our exact itinerary in the next few days (we got a lot of great recommendations from my cousin who lives there) but, again, if anyone has any great recommendations, please share! Even though I lived there for a few years right after college, it seems like there are a TON of new places that have sprung up since then that we cannot miss. But let’s get back to this Double Pumpkin Curry with Shrimp, because it certainly needs its fair share of time in the spotlight. 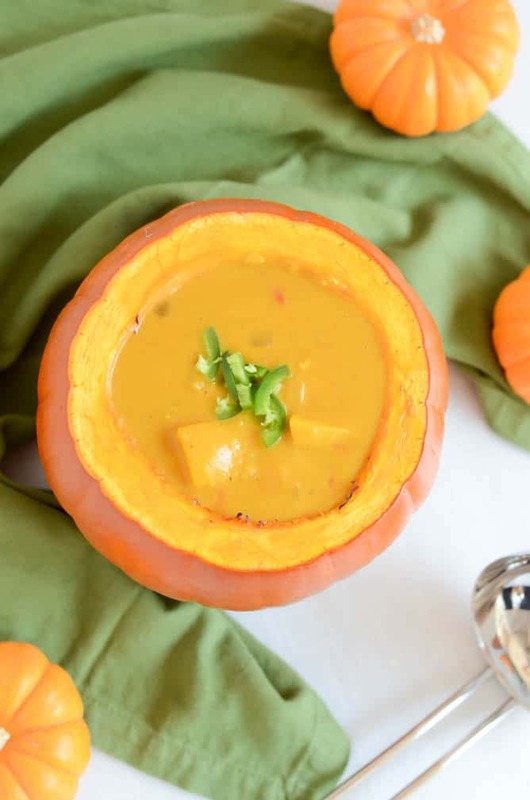 I once had a similar pumpkin curry at a cute little hole-in-the-wall Thai restaurant in Los Gatos, and have not stopped thinking about it ever since. The most memorable thing about it? Well, not only did it taste absolutely phenomenal, it was also served in a hollowed out roasted pumpkin! It was so amazing. Every time you scooped some of the curry out, you got some of the creamy, roasted pumpkin flesh with it. My mouth is watering just thinking about it. Now, I haven’t been to said Thai restaurant in quite a while, but I dare say that this Double Pumpkin Curry with Shrimp is so darn close to the real thing. I’m actually pretty disappointed that we finished our leftovers already because I could REALLY go for some for lunch right now. So what makes this a DOUBLE Pumpkin Shrimp with Curry, you ask? Well, not only do we stir an entire jar of canned pumpkin into the mix, but we also add some cubed, whole pumpkin. 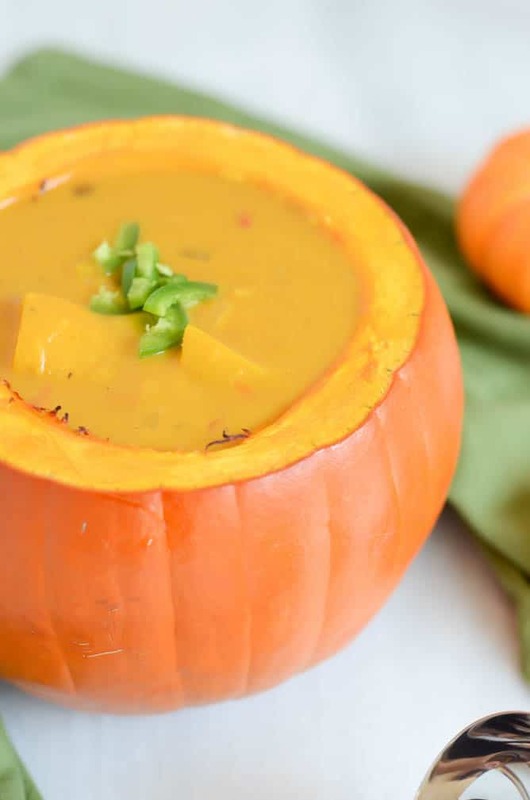 If you don’t like pumpkin, I’m sorry, this dish is probably not for you. We’re using a combo chicken broth and coconut milk for the base, and throwing in some shrimp for good measure. But hey, guess what? Want to make this dish vegetarian or vegan? Easy peasy. Simply use vegetable broth instead of the chicken broth and omit the shrimp. Never been simpler. So, we throw most of the ingredients (save the shrimp for the last minute) into the pot, and add a healthy dose of curry powder. While that’s all simmering away, we get a second pumpkin (I used “pie pumpkins” from Trader Joe’s), remove the top and scoop out the seeds. Roast that in the oven and about 25 minutes later your serving vessel will be ready to rock and roll! That’s it! 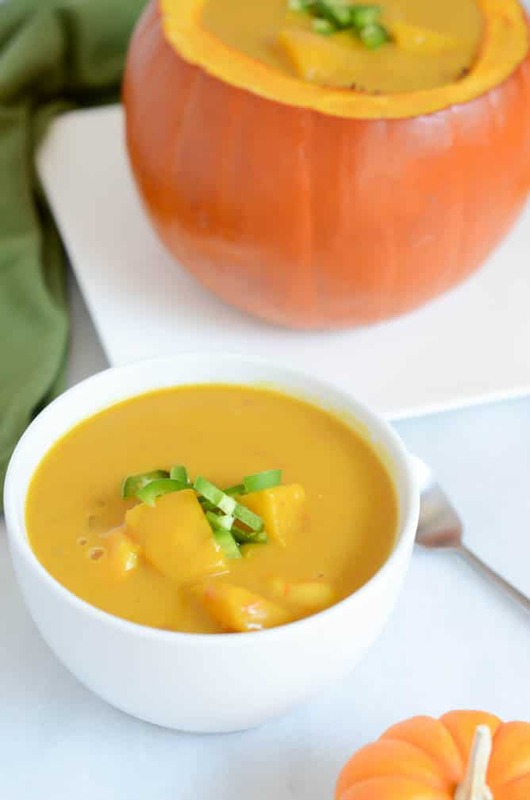 This uber-delicious and incredibly aromatic Double Pumpkin Curry with Shrimp is ready in just about as much time as it will take you to roast the pumpkin you’re going to serve it in. Of course, you don’t HAVE to serve it this way, but I highly recommend you give it a shot at least once. I don’t think you’ll be sorry. 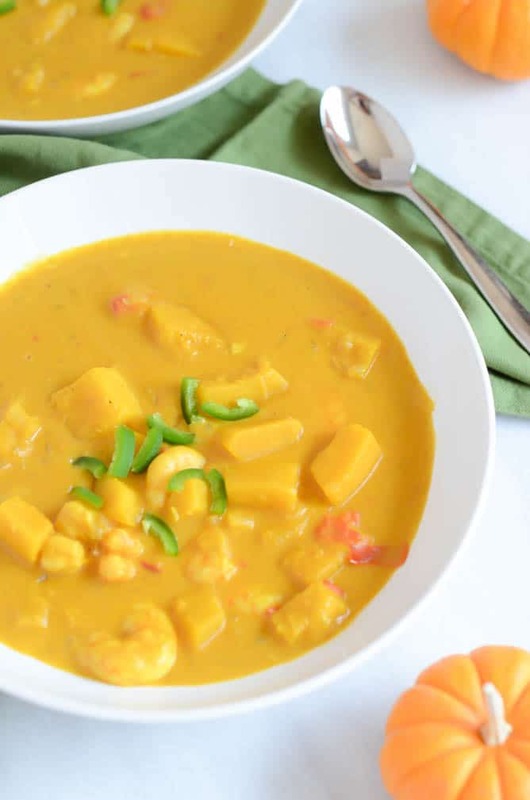 An aromatic, warming curry featuring both pureed and fresh pumpkin and fresh shrimp, perfect for the cool fall weather. In a Dutch oven, warm olive oil over medium-high heat. Add onion and garlic and saute until mixture begins to turn translucent and becomes fragrant, about 3-5 minutes. Add cubed pumpkin, curry powder, cayenne and diced tomatoes, stir to combine and let cook for an additional 5 minutes over medium-high heat. Add canned pumpkin, broth and coconut milk to mixture. Stir to combine and bring to a heavy simmer. 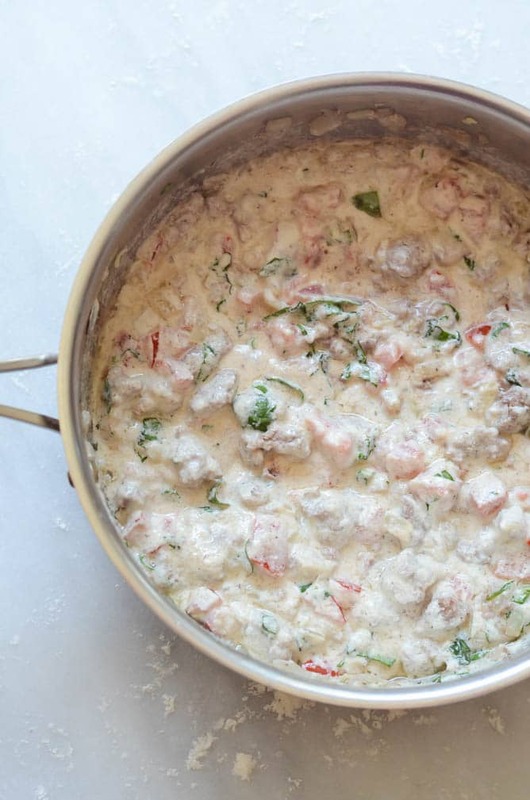 Add shrimp and continue to simmer for at least 8-10 minutes more, or until shrimp turns pink and opaque. While curry is simmering, make your roux. In a small microwave safe dish, melt butter, then whisk in the flour. Add to curry and stir to thicken. The mixture will continue to get thicker the longer it sits. Serve immediately or let simmer on very low heat until ready to serve. To make the pumpkin serving vessel: Cut the top off of a medium pie pumpkin and scoop out the seeds. 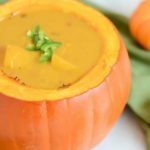 Drizzle one to two tablespoons of olive oil inside the pumpkin and roast in a 400 degree oven for 25 minutes, or until it feels tender enough to scoop out with a spoon or fork. Ladle finished curry into pumpkin before serving. You could also use a few small pie pumpkins to make individual servings. Wine Pairing Note: This curry has a little bit of spice, so a fragrant varietal such as Riesling or Gewurtztraminer would be a perfect pairing for the dish. These tend to have a touch of sweetness to them, which will help balance out the spice. I’ve been practicing major restraint because for some reason I want allllll the curry right now. Seriously, if you look at my recipe brainstorm list, you’ll see about a million and one things I want to do with this magic ingredient. For now, I decided to settle for sharing this Curry Gnocchi with White Lamb Bolognese with all of you, but rest assured that’s not the end of the curry line for this here blog. Tell me, how much do you love curry? Are you borderline obsessed like I am or do you steer as clear of it as possible? Should I keep posting more curry recipes in the next few months, while the air has that little nip to it that makes us want to curl up with a comforting bowl of spice? Or would you rather see more of the usual: pumpkin, squash, apples and the like? 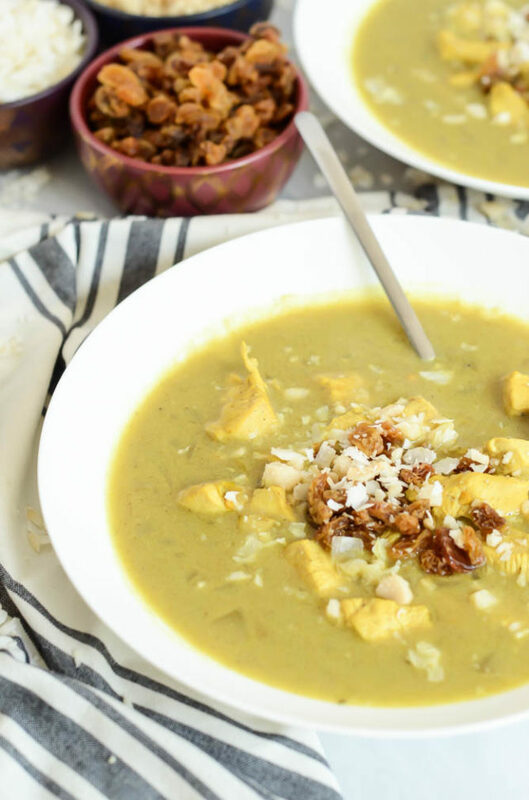 If you’ve been following along for a while, you’ll know that my curry obsession is nothing new. One of the first recipes I posted when I revamped the blog was this Pumpkin Curry Hummus (OMG yum! It’s that time of the year when I have some in my refrigerator at all times,) but there were also these Curry-Rosemary Mixed Nuts, this Healthy Curried Chicken Salad with Apples, and these Summer Rolls with Red Curry-Peanut-Pumpkin Dipping Sauce. The GREAT news is, curry and healthy recipes go hand in hand, so we don’t have to feel bad about enjoying all that our little Indian spice friend has to offer. 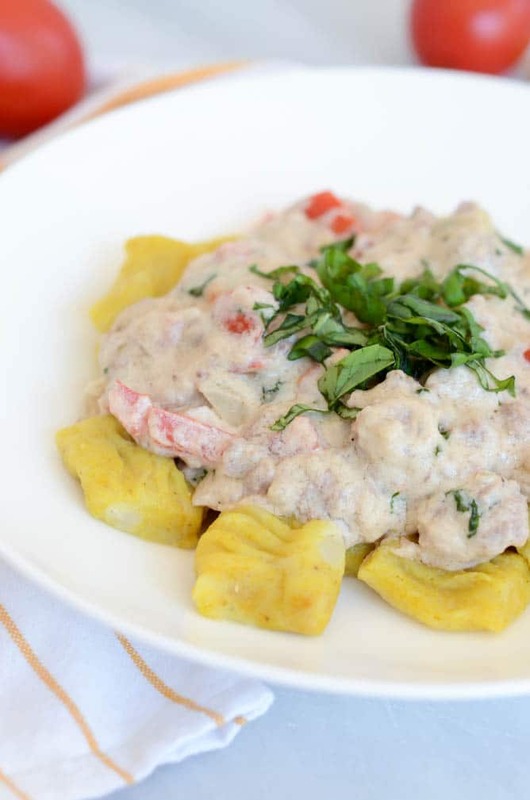 This Curry Gnocchi with White Lamb Bolognese is no exception. 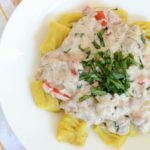 I know, I know, you’re thinking “How can pasta with a white sauce be HEALTHY?” Well, let me tell you my friends, because this is exactly the type of thing CaliGirl Cooking is all about. We all know I’m definitely not into cutting anything out from our diets completely, rather practicing moderation and eating mostly whole foods. Something like that 80/20 way of eating that everyone’s talking about these days. But we all want to enjoy those simple comfort foods of pasta and a cream sauce every once in a while. I feel ya. I crave it too. With this Curry Gnocchi with White Lamb Bolognese, we immediately get that same comfort food feeling and, wait for it, without all of the cream or butter! That’s right folks, the White Lamb Bolognese is made with my OG cashew cream (which has also become a very real obsession of mine, see Exhibits A & B.) In fact, this recipe can be made completely vegan with the omission of the ground lamb. Say what? Ummmm….yea. I really am soooo excited to share this recipe with you because it is so damn tasty, rich and comforting, without REALLY being rich. So healthy! What do you say? Shall we get to it? Raise your hand if you’re super intimidated to make gnocchi from scratch. Me, me! Or at least I was, until I did a little research and dusted off my parents’ old copy of Marcella Hazan’s “The Classic Italian Cookbook.” You see, the recipes that I had been seeing online all involved the use of egg yolks, while Hazan recommends NOT using them, stating that it makes the gnocchi a tad more chewy and less melt-in-your-mouth tender. I could hardly believe that I could make gnocchi out of JUST flour and potatoes, but I decided to give it a shot. I am so glad I did. The process is amazingly simple: We boil whole potatoes and easily peel the skin off afterwards. We push them through a ricer (buy one now, you will NOT regret it) and then mix the riced potato with just enough flour to make a slightly sticky dough. We also cannot forget to knead in the curry powder at this step. Your hands MIGHT smell like curry for two days straight afterwards, but who’s complaining. The dough is rolled out into long, skinny “logs,” which we’re going to cut into about ¾-inch pieces for the gnocchi. Once the dough is cut, we do the little indentation trick with a fork which, according to Hazan, will help the gnocchi cook more evenly. It sounds complicated, but it’s really not. 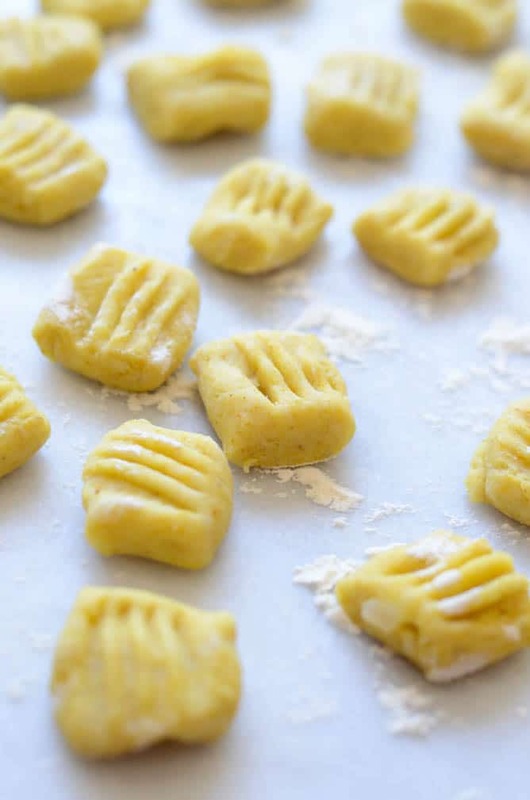 Essentially, you’re going to hold each gnocchi lengthwise along the tines of the fork, then press the gnocchi into the tines with the pointer finger on your other hand (the one not holding the fork) and flick it off onto your floured surface. Essentially we’re making the gnocchi have a little bit of concavity with the fork indentations underneath. We saute our ground lamb with onion and garlic (or just saute the onion and garlic if you’d like to make this vegan) and then add some dried oregano, fresh basil and Roma tomatoes. We drown this mixture in cashew cream and mix it up real good, letting it all simmer together for a few minutes and finishing it all off with a hint of fresh lemon juice. DO NOT skip the lemon juice. It’s seriously the icing on the cake and MAKES this dish. Once our sauce is simmering, we drop our curry gnocchi into a big pot of boiling, salted water. A couple of minutes later, the cute little curry pillows will begin floating to the top of the pot, which means they’re done and ready to be pulled out. We place a hefty serving of gnocchi on the bottom of our favorite pasta dishes, drown it all with the White Lamb Bolognese sauce, and there you have it! A delicious, healthy and homey meal. I may be biased, but this is seriously one of my most favorite meals I’ve ever featured here on CaliGirl Cooking. 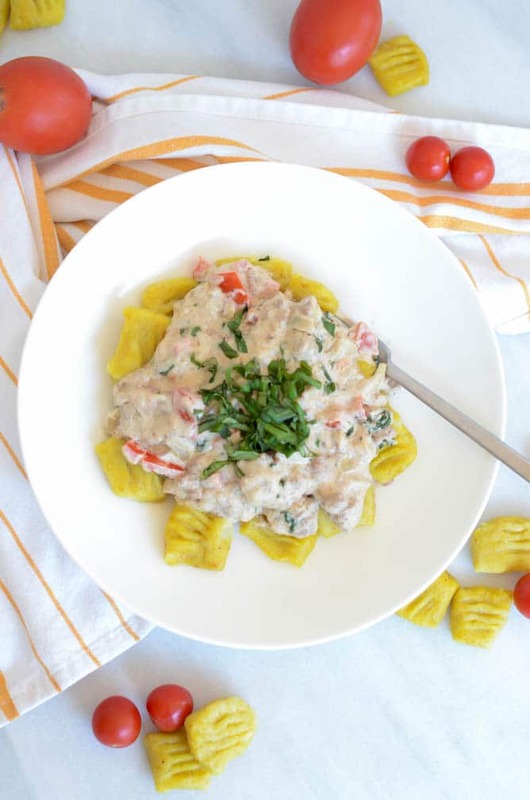 It’s just the right amount of decadent while not being over-the-top, and the gamey, creamy White Lamb Bolognese is the perfect complement to the exotic Curry Gnocchi. It’s perfectly balanced with an insane burst of flavor that will leave you craving more. Now, excuse me while I go pour a glass of red wine, I have some Curry Gnocchi with White Lamb Bolognese to devour. 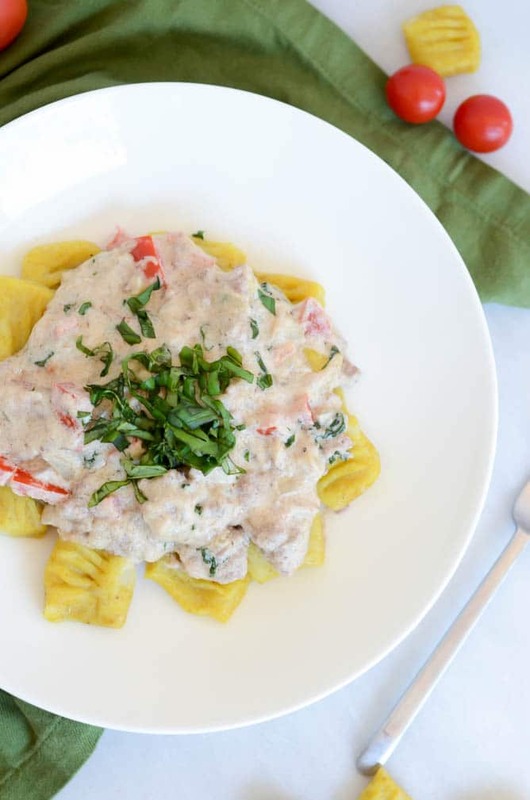 A comforting yet healthy cool weather meal, homemade curry gnocchi is topped with a White Lamb Bolognese made with non-dairy cashew cream, fresh tomatoes and basil. 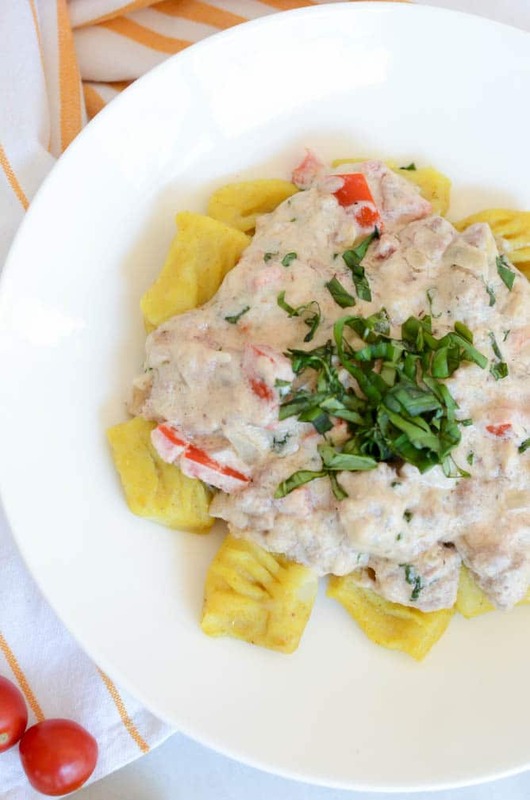 *Gnocchi recipe adapted from Marcella Hazan's "The Classic Italian Cookbook." Place potatoes in a large saucepan and fill with water (to about a ½ an inch to an inch over the top of the potatoes.) Place pan on stove and bring to a boil. Cook at a rolling boil until potatoes are tender, about 30 minutes (be careful not to poke the potatoes too much, as this will cause them to become waterlogged; I used a pair of tongs to lightly squeeze the sides and see how tender they felt.) Once cooked, remove potatoes from water and let cool slightly. Once they are cool enough to touch, peel off the skin. Cut the potatoes into quarters and put them through your ricer into a large mixing bowl. Slowly add the flour, kneading until you get a slightly sticky dough (that’s still not too difficult to handle.) I used about ¾ of a cup of flour, but this may vary depending on the potatoes you are using. Knead in the curry powder. 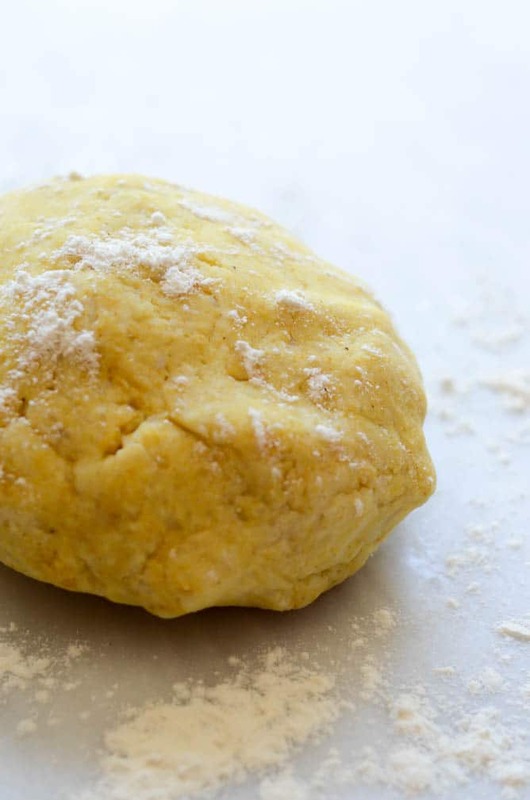 Divide the dough into about five pieces on a lightly floured surface and roll each piece into a long, skinny log, about 3/4-inch in diameter. Cut each log into ¾-inch long pieces (the size of gnocchi.) 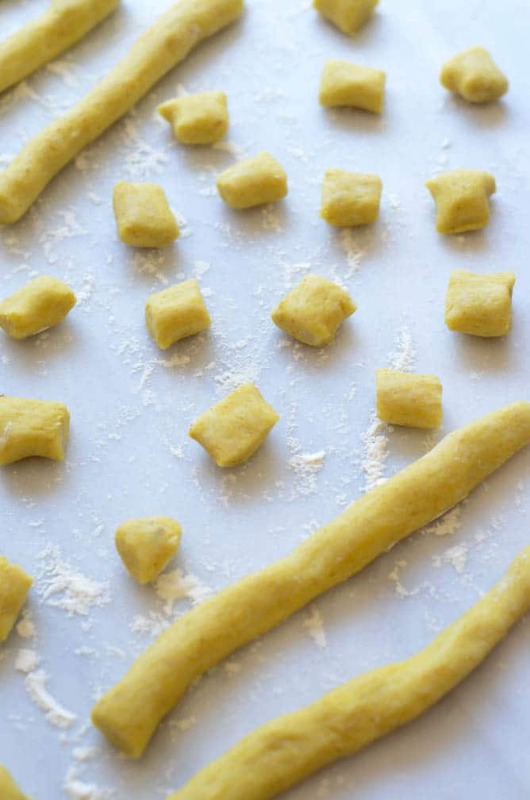 Using a fork, hold each gnocchi lengthwise against the tines of the fork with the pointer finger of the hand not holding the fork, then gently flick it off. This will give the gnocchi a little concavity to cook more evenly. Set prepared gnocchi aside. Place a large pot of heavily salted boiling water over high heat to bring to a boil. Next, prepare the sauce. In a large saute pan, cook the onions and garlic in two tablespoons of olive oil. Once the onions and garlic have started to turn translucent and become fragrant, add the ground lamb. 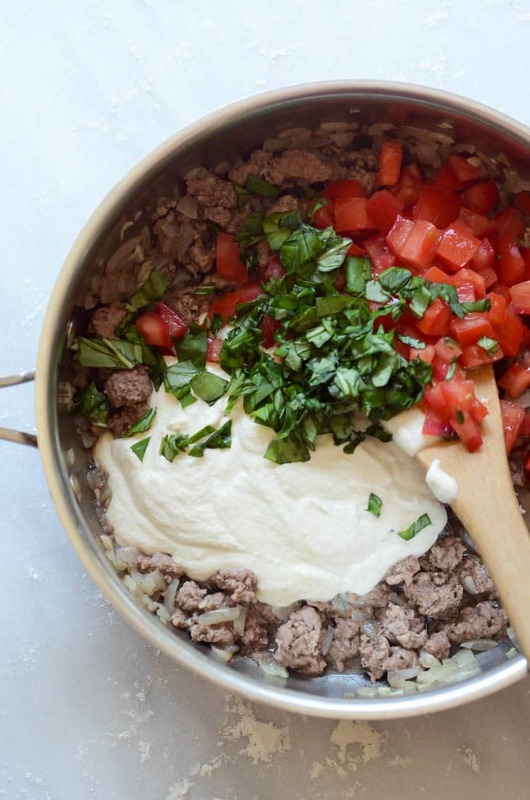 As the ground lamb begins to brown, add the oregano and tomatoes. Stir until the lamb looks mostly cooked, although a few shades of pink are okay as we’ll be cooking it a bit longer with the sauce. Add the cashew cream, fresh basil, salt and pepper and stir to combine. Let simmer for about 10 minutes for the flavors to meld, and squeeze in lemon juice, once again stirring to combine. Once your large pot of water has come to a boil, begin adding the curry gnocchi in batches (about a dozen at a time.) Once the gnocchi floats to the top of the pot, remove with a slotted spoon. Spoon gnocchi onto individual plates and top with a generous portion of the White Lamb Bolognese. Garnish with more fresh basil and serve immediately. Wine Pairing Note: The hubs and I LOVED enjoying this with one of our wedding wines, the Newton Claret. Any Cabernet Sauvignon or Syrah (a classic pairing for lamb) would be fabulous with this. 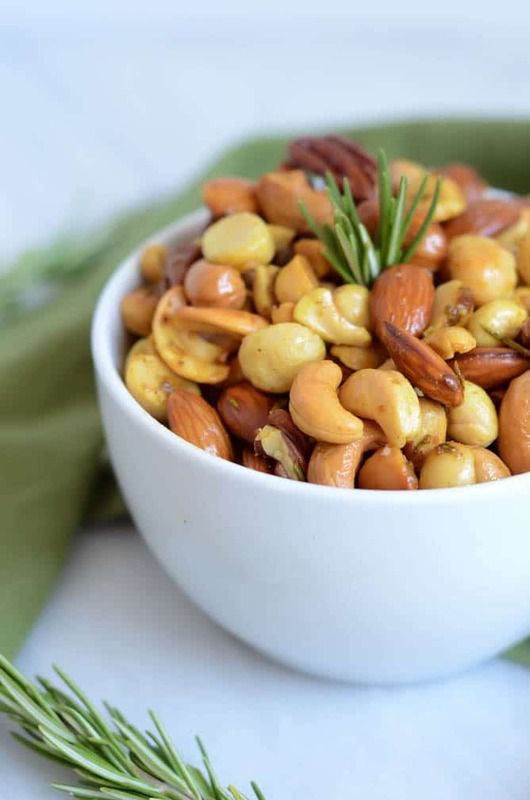 A healthy, flavorful and protein-packed appetizer of mixed nuts roasted in a delicious blend of coconut oil, honey, fresh rosemary and curry powder. The perfect addition to any cocktail party or picnic! Your cocktail party savior has arrived. 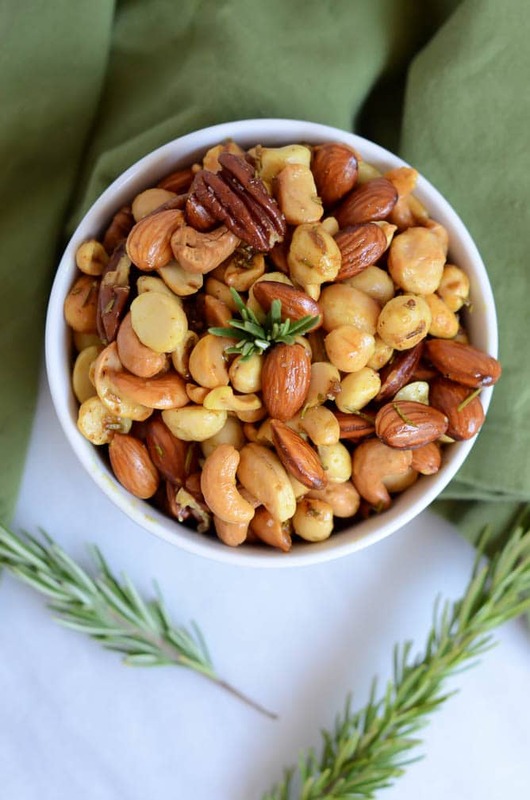 And its name is Curry-Rosemary Roasted Mixed Nuts. These delicious, exotically spiced little nibbles are the hors d’oeuvres of your dreams and, judging by how quickly they disappeared when I brought them into the office, they’ll be the hit of any party you bring them to. We’re really looking forward to spending some time up in Wine Country celebrating someone else for once, as it seems we’ve spent most of our last few trips up North completely dedicated to planning our own wedding. We’re looking forward to relaxing, eating, drinking, and of course celebrating! Let me tell you, my Napa friends certainly know how to celebrate! 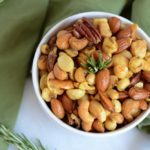 Alright, I know I digressed there for a minute, but it all ties in to the reason for this post: the legit celebration-worthiness of these Curry-Rosemary Roasted Mixed Nuts. The bright yellow from the curry powder and pop of green from the fresh rosemary make these both look AND taste incredibly festive. 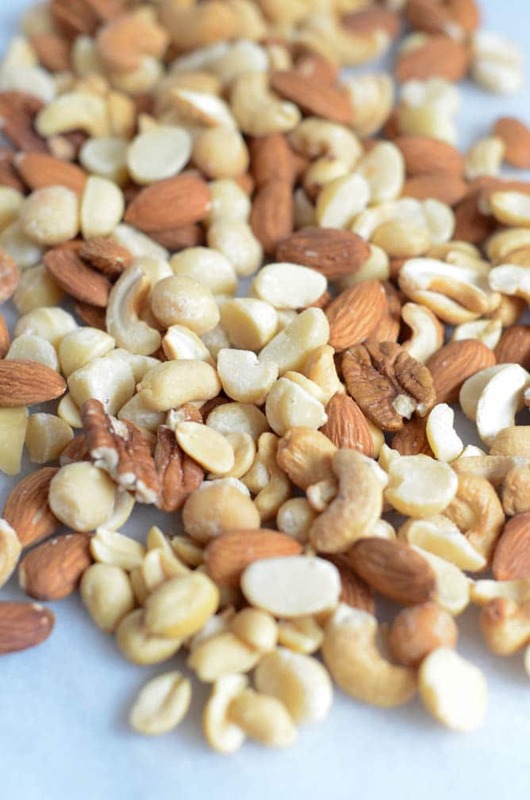 The best part is that, aside from the nuts, there are only FIVE ingredients, most of which you will already have on hand in your pantry or refrigerator. You choose! I personally just threw together a mish-mash of whatever nuts I had taking up space in my pantry, which consisted of pecans, almonds, peanuts, cashews and macadamia nuts. In past recipes I’ve relied solely on butter, but since we’re on a healthy kick (and since coconut pairs perfectly with curry) I knew this would be the perfect substitute. Because we always need a little balance of sweet and spicy, right? Because a little salt goes a long way. THE star ingredient of the show! Pretty easy, right? Not only does this recipe require very few ingredients, it takes almost no time to make. The longest wait you’ll have is for the nuts roasting to their golden delicious perfection in the oven. 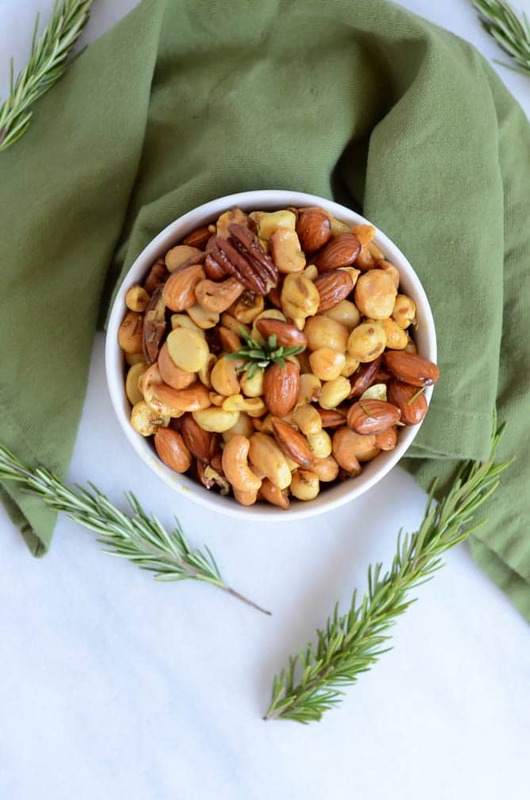 We already know that these Curry-Rosemary Roasted Mixed Nuts will be the star of your next cocktail hour, but they’d also be the perfect addition to a summer picnic basket. They’re healthy, portable and don’t need to be kept in the refrigerator. Sounds like picnic food to me! Or, you could just whip up a batch and keep a Tupperware stashed in your desk drawer at work for the perfect, protein-packed afternoon snack. Just be sure not to tell your coworkers or they might disappear! 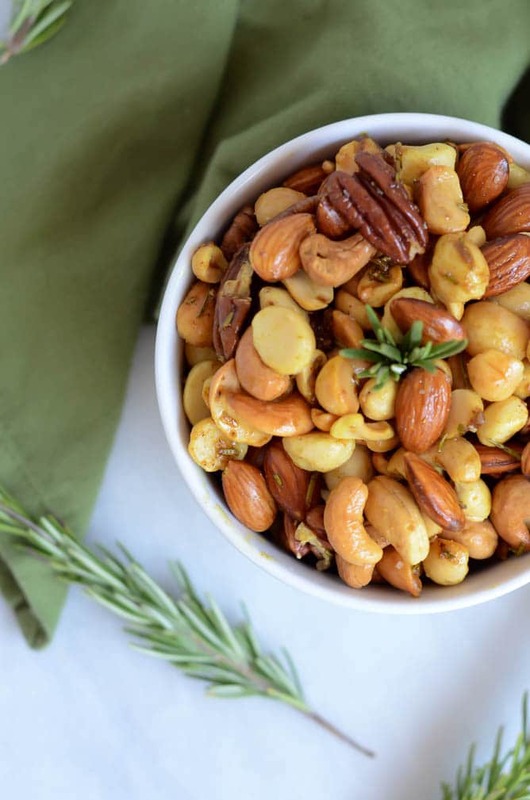 So, if nothing else on your Monday night, at least go whip up some Curry-Rosemary Roasted Mixed Nuts. I guarantee they will put you in a better mood for the rest of the week! Preheat oven to 350 degrees Fahrenheit. Take a large jelly roll pan and line it with aluminum foil. Set aside. In a large mixing bowl, add all ingredients (nuts to curry powder) and stir to combine. Pour nut mixture onto jelly roll pan, spreading out in an even layer for uniform roasting. Roast at 350 degrees for 15 minutes (you may want to open the oven and give the nuts a little stir about halfway through to make sure all sides get roasted.) Let cool slightly before serving. Wine Pairing Notes: Because there’s a little bit of spice to these nuts, a slightly off-dry Riesling would pair wonderfully. You’d also do well with an oaked Chardonnayto bring out the nutty flavors.